If you are thinking about North Star for your son for the *Summer of 2020*, then one of our Rookie Weekends may be for you. Please keep in mind that you are welcome to Visit Camp anytime if these dates do not work for you. 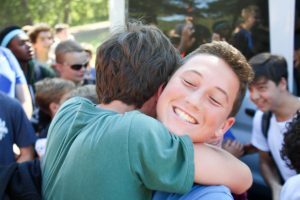 We understand and value the importance of choosing the right camp for your son, and our Rookie Weekend program is geared to give you a firsthand look at what makes North Star so special. The Rookie program will run from early Saturday afternoon until Sunday afternoon, though our Rookie Campers do not sleep at North Star. Along with the other prospective campers, your son will spend the weekend with our current campers and staff participating in our program. On Saturday the boys will get an introduction to camp as the meet our staff, tour camp and participate in some of our favorite North Star games. Before leaving with you for the night, the boys will get a chance to choose their activities for Sunday, just like our campers do to select their activities each week. When they return Sunday morning, the boys will jump right into the activities they selected. Over the course of the weekend, parents will get a complete tour of camp, see camp in action, and meet our staff. Parents will also have the opportunity to sit down with North Star Directors for a question and answer session, where you can get the inside scoop on North Star. You will even get to taste the camp food and participate in some parent programming before taking home your future North Star camper. We are very proud of our program at North Star, and we hope you and your son will join us for a Rookie Weekend. North Star is located approximately seven and a half hours from the Chicago area and three hours from Minneapolis. We’re happy to provide directions to camp as well as information on Hayward area lodging. Admission is free, please RSVP!